As the time comes for the Fareshta to depart from this earth and go off to Chinvat with the Fravashi, it addresses the priest: ‘O Righteous priest! You have created me through your prayers and these specific implements! I am what you have made me! My job is to take the benefits of this ceremony and offer them to the Ruvan of Behdin Jamshed Behdin Rustam, who toils, far far away! How will I reach there? I will reach there only if you have created me righteously! I will be effective only if you have been effective and righteous! I will be able to succeed in my mission only if you have taken the necessary precautions, if you have lived a life of piety and purity, if you have passed noble thoughts during this time! If you have done so, I will succeed in my mission. If that happens, not only will I bless you, but the blessings of the Anusheh Ruvan and seven generations before it will be showered upon you! The blessings of Dadar Ahura Mazda, the Yazatas, the entire Cosmic Government will inundate you! This is a very important dialogue which happens, unknowingly between the Fareshta of the ceremony and the priests performing the ceremony. Many of my brother priests consider Mobedi to be a business or a vocation. It is their understanding that being a priest is akin to any other secular job, like a teacher or a corporate executive. Many believe that their job starts when they put on the Mobedi dress and begin their prayers and ends when the Behdin or the Panthaky pays them and they are off to home. Once outside the confines of the Agiary, many Mobeds behave in a way that brings shame to their profession. I am very pained to write that Mobeds performing the highest ceremonies of our religion like Nirangdin, Vandidad and Yazashne day in and day out, those who serve as Boywallas of Atash Behrams and even the Iranshah, do not have the courtesy of even covering their head when outside the Agiary. They see no harm in eating out in public, being seen in bars and restaurants and dressed in the most casual and degrading type of clothes. The common excuse given is : ‘Are we not humans, should we not enjoy life like others, can we not spend our hard earned money the way others do?’ Their questions are valid. But their understanding of the situation is wrong. Being a Mobed is not a part time profession, it is not even a full time profession – it is a way of life. A Mobed does not have any fixed hours of work – he is on duty all the time. Mobeds are a class of people who the whole community looks up to. In such circumstances it is the beholden duty of every Mobed to not only be seeing living his part, but actually living his part. Entering the profession of Mobedi was a conscious choice for almost all of today’s Mobeds. They were not forced into it or pushed into it. If they feel it is too arduous a task, they can easily upgrade their skills and switch to another field. But once in the field, it is the beholden duty of every Mobed to honour and respect his calling, to live a life of morality and truth, piety and purity. Look at the photographs of priests of a 100 years ago, silently hanging from the walls of our Agiaries and Atash Behrams. 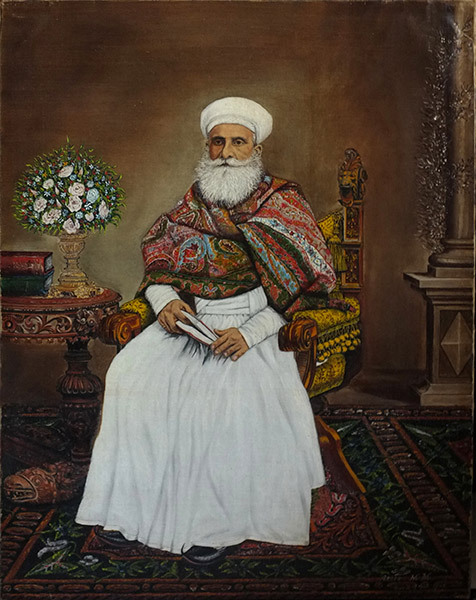 Here is a portrait of Dastur Noshirwan Dastur Kaikhushroo Behram Framroz of Surat (1822-1897). Do they not command respect, is their bearing not regal and full of piety? Look at the priests of today. Enough said. Why is this important? It is important because the end result of any ceremony does not lie in the mere accurate recitation of words – a tape recorder or MP3 player would be sufficient for that. The real end result of the ceremony lies in the quality of life lived by the priest. Let me give you an example. Priests recite the Atash Nyaesh many times a day. The opening words of the Nyaesh ‘Us moi uzareshwa Ahura…’ are such a powerful Nirang that if a priest of purity and piety recites these words in front of a few pieces of dry sandalwood, incense and chips, the fire should light up on its own. Yet how many of us can do this today? Let’s take another example. In the Hom Yasht, four great heroes of ancient Iran are shown as having pounded the Hom twigs with great fervour and dedication and out of their prayers, each begat sons who became even more illustrious than their fathers. Which Parsi does not know of the exploits of Jamshid, son of Yima; Faridun, son of Athavya; Keresasp and Urvaksh, the sons of Thrita; and of course Zarathushtra, the son of Pourushaspa. Today hundreds of Yazashnes are done and Hom is pounded, but where are the illustrious sons being born? Rather the reverse seems to be happening, especially in the houses of Mobeds. Our most pious Dasturji Meherji Rana used the Vanant Yasht Nirang, to pull down the silver plate held aloft in the sky as another sun by a sorcerer. Can we do the same? Readers of Frashogard will also remember the incident of the solitary beard hair during a ceremony and how it adversely affected the outcome in the case of Dastur Ardeshir Kermani and Shah Mahmud of Ghazni. The point I am trying to make is not to discourage anyone from having ceremonies. Rather, the reverse is true. But the point is that Mobed Sahebs must understand the great spiritual burden which has been placed on their shoulders. Readers of Frashogard who have gone through the life of Mobed Behramji Unwalla will realize how Mobeds Sahebs lived in abject poverty 100 years ago. Today, Mobed Sahebs are paid handsomely for their services, sometimes far more than is deserved, but today, even with material prosperity, many priests are unwilling to shoulder the few difficulties and hardships of a Tarikat-based life which is the hallmark of a true Athravan. Thus the quality of the Fareshta of the ceremony is directly linked to the quality of life being lived by the priest conducting the ceremony. The words of the Fareshta quoted above have to be understood in this light. The blessings and curses mentioned there are not allegoric or poetic – they are real – this passage is taken from the 11th Ha of the Yazashne. A large part of the benefit is given to the Ruvan for whom the ceremony was performed. About 11% (1/9th part) of the benefit is reserved for the priests who performed the ceremony. Another percentage (exact figure is not known) is reserved for the Farmayashne – the Behdins who sponsored the ceremony. Another percentage (exact figure is not known) is reserved for the Zoroastrians who attended the ceremony. Another percentage (exact figure is not known) is reserved for the village or city and country in which the ceremony was performed. Another percentage (exact figure is not known) is reserved for the onward progress of the entire physical world. Another percentage (exact figure is not known) is reserved for those unfortunate Ruvans for whom no ceremony is performed by their relatives. In this manner, the benefit of the ceremony is shared not only with the Ruvan of the deceased but also for the entire creation. This is the true universal nature of Zoroastrian ceremonies. It is also clear therefore, that for every nine ceremonies that a priest performs with full devotion and dedication, he receives the benefit of one entire ceremony for his own Ruvan – over and above being paid in physical terms for his labour! What better profession can one be in? Inversely, what greater spiritual suicide can be committed than by illegally shortening or making willful mistakes in our ceremonies? Ervadji,thank you once again for sharing simple,but the most important facts of a true mobeds Tarikat based life.Does a mobeds family members(wife,sons etc)have any role to play,in maintaining all the Tarikats?How important is the wife’s role in the life of a true mobed? After reading the above article I have realized how imp every small act & thought is while attending such religious ceremonies & why we as Behdins should really respect, admire & get inspiration from the Dasturji’s (the genuine ones). The articles you post do show us the real meaning of living life like a real Zarthosti which otherwise we would never even be informed of. Your writings (thru the knowledge recv from Ustad Saheb) are very inspirational & motivating for us to lead a life with purity & piety, also would also like to attend a lecture / class by you whenever in South Mumbai. Thanks as always for enlightening our souls. I have to thank you from the bottom of my heart for your writings. Having lost my father recently, I have gained great comfort from your writings. The Wonderous Circle of Life has been my guide in doing the prayers for my dear departed father. God bless you. Of all your blogs, I like this the best, It is a MASTERPIECE! for it gives us an insight into what happens to us after we depart from this earth. I hope that before you conclude you will enlighten us on what happens to those souls whose good and bad karma are of equal proportions and also of those who are born of mixed marriages.